A major international law firm with hundreds of employees and dozens of satellite offices wanted to expand its threat hunting capabilities through analysis techniques that required deeper network visibility. They decided to use an open-source Bro Network Security Monitor, and initially tried installing and running it on their own open-source server, but found they could not scale it to their environment. 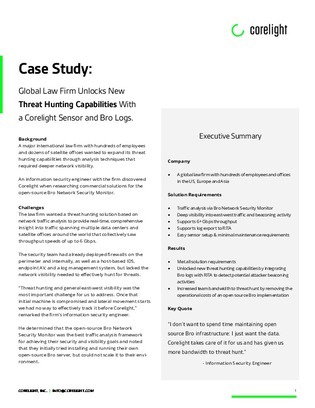 To help them scale, the law firm used a Corelight AP Sensor, which ingests network traffic and outputs it into Bro logs that summarize all traffic by protocol-specific tables, and describe each event in specific, actionable detail. Find out more about what Corelight can do in this case study.